The MiniVet Guide is a small easily portable booklet containing what you need to know to get you through everyday presentations. It is designed to help students through their final year of rotations as well as aid new graduates through their first years of clinical practice. It is a perfect study companion for final exams, a great reference for practical rotations and will be your backup to get you through busy morning consults. 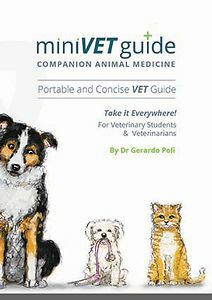 The MiniVet Guide is there to make our veterinary careers a little easier. It is not just a book- it's a life saver!